Direct Bookings - We would like to offer all those who book direct online a welcome drink. We can be contacted by email info@masdelaserra.com. It will give us a chance to offer the most suitable room for you as they are all very different and unique and some are more suitable for families. We can also tell you about the activities on offer around the masia and help you plan your trip as well as advise on airports. 2019 Summer availability. We still have space for whole house rentals in July / August 2019. please get in touch with us for further details. The masia is a great venue for a large family gathering or celebration. Fitness retreat at Mas de la Serra. 13th-18th May 2019. We still have a place left on our inaugural Fitness week. do get in contact us for more information. ‘A rustic château set in landscape so grand and rugged you might almost be reminded of Scotland, it it weren’t for the fields of almonds in soft baize green unfurling away from the house.’ Financial Times 2018. 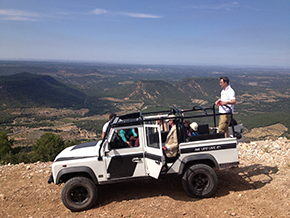 The Mas de la Serra Wilderness Retreat is a beautifully converted fortified farmhouse set in 60 acres of almond groves and pine and oak forest with unparalleled views across to the coastal mountains between Barcelona and Valencia. The ‘masía’ is an extraordinary exclusive, fully staffed, large villa as well as an acclaimed boutique hotel. 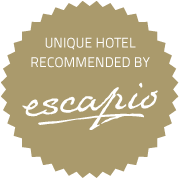 The hotel has been rated in the Condé Nast Gold List and is one of the remotest hotels in Europe. For those that are looking to discover the real Spain with its medieval villages and customs in complete comfort this is the ultimate getaway. It’s also a fantastic property for those looking for an exclusive hire for a celebration, wedding or a gathering of friends. Few places offer our capacity, home away from home atmosphere, country cooking, incredible array of activities and wow factor. 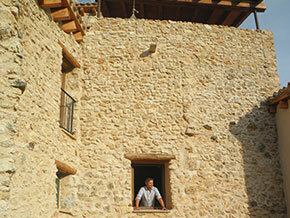 The masía has been listed in the ‘Top 20 Mountain retreats in Europe’ The Times’.